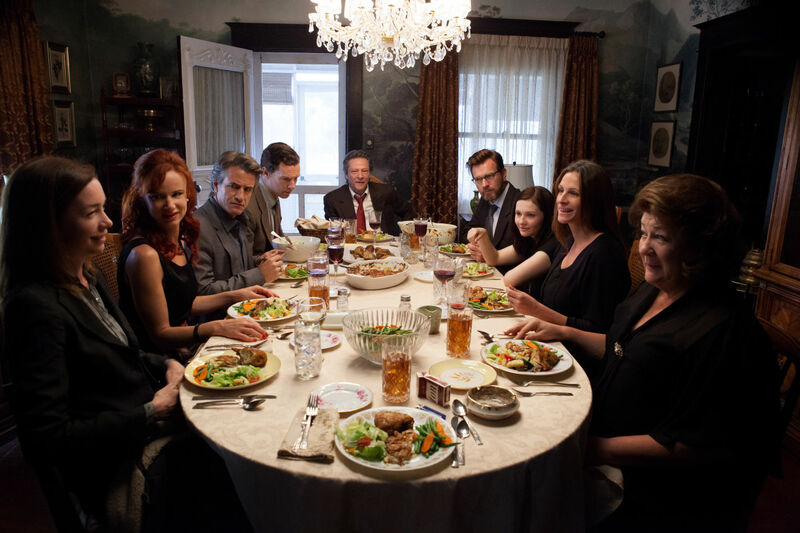 If you think your family is dysfunctional, spend a couple hours with the Weston family of Osage County, Oklahoma, and you’ll think your family is the Waltons. Let me introduce you to the Westons. Patriarch Beverly is a once-famous poet and self-ascribed alcoholic. His wife, Violet, is suffering from mouth cancer and is addicted to a multitude of pain killers and anti-anxiety medications. Violet is a mean and bitter piece of work. While your first thought may be that it’s the pills talking, you quickly realise that she was this way long before she became ill. Perhaps her mouth cancer is karma for a lifetime of verbal abuse that she inflicted on those around her. Her causticness has pushed their three daughters, Barbara, Ivy and Karen, away. Only Ivy maintains a relationship with Violet, though she has learned – probably the hard way – to keep her private life private. Barbara, who now lives in Colorado, has developed a defensive toughness, which could explain why her marriage to college professor Bill is in its last throes. Youngest daughter Karen seems to have been most affected by the family dynamic. She has moved to Florida and is now engaged to Steve – a fast talking, fast driving, older man who has been married three times before. Violet also has a sister and brother-in-law, Mattie Fae and Charlie, whom she seems to love, or at least care about. Mattie Fae and Violet have a shared history of growing up in an abusive household. History repeats itself. Mattie Fae has written off their adult son, Little Charlie, who is a good person though a little slow on the uptake. The film opens with Bev hiring a Native American woman as a live-in cook and caregiver for Violet. When he disappears a few weeks later only to be found to have drowned, it’s apparent to everyone that his death was a suicide. Violet, naturally, is distraught and the family gathers around her to provide her with moral support. Tensions comes to a boil at the post-funeral dinner table (don’t they always?) when Barbara can no longer sit idly by while Violet inflicts each knife wound into her daughters with laser-guided precision. She is a woman who is determined to make everyone around her as miserable as she is. The sisters try to reconcile with each other and with their mother but they, like Violet, are already too damaged. In the end, all the can do is try to save themselves. August: Osage County was penned by Tracy Letts, who also wrote the Pulitzer Prize-winning play of the same name. This is a film that is all about the acting. There are no exploding cars or 3D effects to hold your attention. It’s the just the actors and their words. To that end, Meryl Streep, as Violet, is superb. She once again proves why she is the most talented actress in American cinema today. All the other actors are mere moths buzzing around her flame. Some, like Chris Cooper and Margo Martindale have their moments in the spotlight but the film is really Meryl. If she wins the Best Actress Oscar®, it will be well deserved. Go see this film but don’t expect to be entertained in the conventional sense. Like much of Violet’s medication, it’s a bit of a downer. It is good acting though and, if your family is only half as screwed up as this family is, you will feel quite relieved.